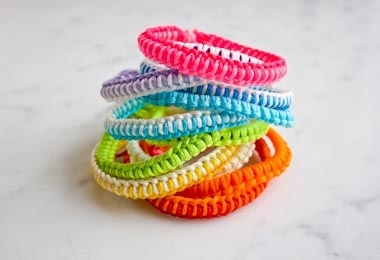 Even if you’ve never tied a knot, you can learn to make our Super Easy Friendship Bracelets in a jiffy. Cute, colorful, and quick, they are as much fun to make as they are to give! Our Super Easy Friendship Bracelet Pattern is appropriate for kids and adults and includes thorough instructions for two design variations. Choose to receive your Pattern as a PDF download or a hard copy, and for a list of materials you'll need to make your Super Easy Friendship Bracelets, please click Product Details, above. Another option: These materials, including the Pattern, come in our Super Easy Friendship Bracelets Kit.